1992, 272 pages including appendix. I came across this book just as I was about to go to Canada in 2011 to research the Upper Canada period of ‘my’ Judge Willis‘ career. I began reading it and became increasingly excited that it captures the small-town, censorious attitude of a small Canadian outpost of Britishness in the 1820s so well. No wonder an English judge, full of his own importance, fell foul of this intermarried web of government officials! But then there were bags to pack and planes to catch, and I didn’t finish it. I’ve just returned to reading it, some three years later, and almost at the end of my first draft instead of dabbling around in the shallows of my early research. On this second and now completed reading, it doesn’t so much open up new areas (thank goodness, I must say), but it does confirm and add colour to the context of 1820s York (Toronto) in a highly readable and informed manner. The central event of this book is what has come to be known as the Types Riot. Late on the summer afternoon of 8 June 1826, when the editor of the Colonial Advocate newspaper was away, nine young ‘gentlemen’ smashed their way into the newspaper office, emptied the type cases from their cabinets, strewed fully made-up printing frames across the office, then carried type cases across the road, along the wharf, and threw them into the bay. They were not drunk; they made no attempt to disguise themselves and they were watched without intervention by several bystanders, including two magistrates. The argument of this book is that there is a direct link between the Types Riot and a series of satirical articles published some weeks earlier in the Colonial Advocate known collectively as the Patrick Swift commentaries. These articles, published at very great length over several issues, were a fictitious report entitled ‘A faithful account of the proceedings at a general meeting of the contributors to the Advocate, held in Macdonnell’s Parlour on the evening of Monday, May 1st 1826’. These ‘contributors’ were ostensibly gathered to select a new editor for the Advocate as, supposedly, the present editor, William Lyon Mackenzie, had resigned. ‘Patrick Swift’, [described as “a grand nephew of the famous Doctor Johnathan Swift, Dean of St Patrick’s in Dublin” and the author of Gulliver’s Travels] was selected. The ‘report’ described the debate and ribald comments of this drunken group of fictional characters. In this way, ventriloquizing through the fictional ‘Patrick Swift’, the real-life editor of the Colonial Advocate, William Lyon Mackenzie launched on a tirade against the pretences of the Upper Canada ‘gentry’. 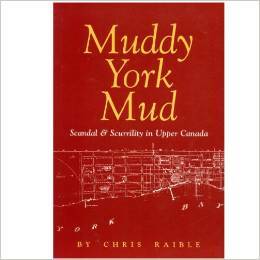 In a thirty page, small-font appendix to the book, Raible reproduces the commentaries, annotating them to identify the victims of the humour: judges, lawyers, the attorney general, prominent clergymen and even the lieutenant-governor and his wife. In the short chapters of this book, Raible ranges chronologically and episodically over a number of grievances and scandals that led to and flowed from the Types Riot. It’s not an easy task: many of the events occurred in geographically disparate locations, across a long period of time. Although by themselves they are trivial and petty, together they add up to the abuse of power by a puffed-up and mutually distrustful clique with the levers of judicial power in their grasp. Raible keeps the tone light, with no apparent historiographical framework. There are footnotes (called ‘Sources’) and a bibliography, but you’re certainly not aware of them while reading the book. There’s a tongue-in-mouth jocularity that runs through the book, and it reflects the rambunctious/nostalgic tone of the antiquarian books that have provided much of the source material. For Australian readers, there’s definitely a touch of the ‘Garryowens’ about it. This entry was posted in Book reviews, Upper Canadian history and tagged Upper Canada, William Lyon Mackenzie. Bookmark the permalink.